Author Moreen Torpy shares her challenge, read the article and enjoy. I have a deep need to be organized—a good trait for a Professional Organizer, I believe. And by working with clients and family members over the years to help them become organized and downsize their possessions, I’ve learned a fair bit. I’ve even downsized my belongings a few times; however the last time wasn’t as easy as I’ve been telling people. “It gets easier with every move” I said. “With less to sort through, it will take less time” I said. But I learned that the less there is to downsize, the harder it is. Why? Because it’s the best of the best that remains. And when that won’t fit into a smaller space, some of it must go. Space isn’t elastic so it can’t stretch to accommodate all we might want to put into it. Sometimes I wish it would! Several months ago I embarked on an exercise of extreme downsizing. I’d already moved from a 10 room home to a five room apartment, letting go of enough to furnish another entire living space. It was a relief to get rid of most of those items. Then a few years later found myself moving from there to a three room apartment. Clearly what was left was still too much. This time I wasn’t able to fully furnish another place, but just about. And that’s when I realized the project was a bigger challenge than I expected. When I write about downsizing and how difficult it is, I know of what I speak. It’s hard work physically, emotionally, spiritually and psychologically. I didn’t want to move to such small place, but for health reasons it was necessary. Many times through this experience I reflected on clients and readers of my book about downsizing and how they felt or might feel when their turn came. So I put into action the tips I provide to others. To improve myself physically, I changed my eating habits and got plenty of rest, even napping if I felt it necessary during the downsizing and packing process. Spiritually, I began meditating on a regular basis to calm my racing thoughts, mostly negative due to the circumstances. Emotionally and psychologically, I blogged and journaled to rid myself of those negative thoughts and warn readers of those blogs that even for someone like me, this was a huge challenge. Being an Organizer doesn’t exempt me from anxiety. Of course, what I made public weren’t my deepest, darkest thoughts. I saved those for my journal that only I see. It’s nine months later and I’m settling into my new nest. I’m feeling the urge to hang pictures now. This is a good sign I think. I’m making the place mine and finally overcoming the negativity I’ve been carrying. As I look around now to see the place finally taking shape, I feel better about both myself and my living space. And it looks organized. What more can I ask? We would be honored for you to reprint this article. If you do, please include the resource box below with the links intact. 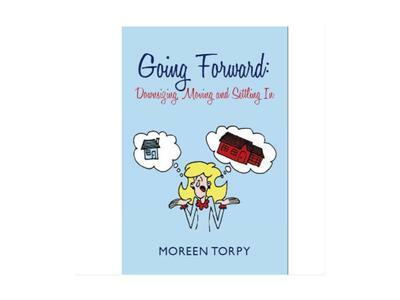 Moreen Torpy is the De-Clutter Coach, a Professional Organizer, Author, and Speaker. Her new book is Going Forward: Downsizing, Moving and Settling In. See http://GoForwardDownsize.com for more about the book and http://decluttercoach.ca to learn about her organizing services and other books as well as receive a gift. Thanks Jan. Quite an experience! It's so powerful when we are able to share both our vulnerability as well as our lessons in life. I found it more of a challenge to downsize my mum's stuff than my own. I look forward to getting rid of even more stuff - although books and papers can be a challenge for me. Look forward to reading your book! I appreciate your comments Mari. I've certainly revised my approach to downsizing for clients as a result of my recent downsize. It's too early for that to be reflected in my book, but I'll revise it at some point. Hope you enjoy reading it! I'd appreciate knowing your impressions once you've finished reading. Thanks for hosting me PaTrisha-Anne! It's an honour to be a guest on your site. Moreen, I so appreciate your honesty about the anxiety and struggle that downsizing can bring. I feel ready to tackle it, but I've got to get your book first! Delighted to have you share your story Moreen with my readers.